Another great piece of glass art from Grace Glass will leave you speechless! Made of a high quality borosilicate glass, this Saxo Bubbler is intended both for herb and oil users. A detachable male bowl with an inside screen and handles on the sides is used for placing your herbs. An oil dome and a glass nail are used for attaching your oil. An inside drum percolator will break up your smoke before the latter reaches your mouth. A fascinating bending neck will offer you a comfortable grip. The white Grace Glass logo features at the front of the flatbottomed tube. 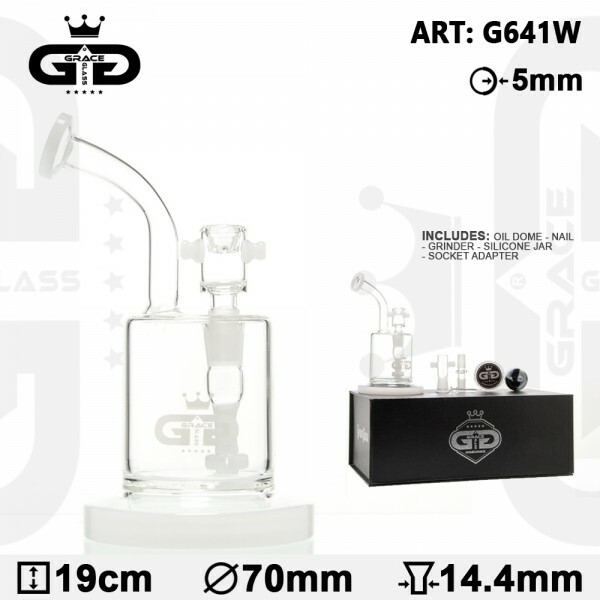 The whole set-up is delivered inside a box, including a 2 point oil dome, a nail, a grinder, a silicon jar, screens, and a socket adapter.